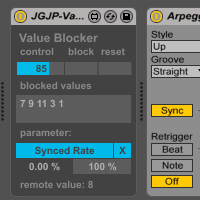 This device is made to block certain values on a dial or slider, a typical example would be the Value Blocker controlling an arpeggiator sync rate and blocking 1/3, 1/6, 1/12 etc. so when you twist your dial it will skip these values and you can go straight from 1/2 to 1/4 to 1/8. It can be used on any parameter. Click the box on the bottom left then click the parameter you want to map, use the Control dial to choose a value you want to block and press the block button. Blocked values will show up in the text box below the buttons and you can even write them in yourself, they will always display as integers. To reset the list press the reset button. Hi,Great idea thx thx thx. This device is again a Great helper I found . Thanks again that you give me the chance to work with. Thanks for your comment Sebbo, I’m going to upload a new version of this device in the next few days so if you’re interested check back next week and it should be done! Hi! Nice app here! I’ve dream about a thing like this one. If I can ask for an improvement, it would be to get the real value from the target device in the macro (displat 1/2 , 1/4 … instead of 0..127). So cool, thanks. unique, what i was looking for almost exactly. Thanks for your comment Paul, glad you found what you were looking for.